If you weren’t sure what the Marvel Infinity Stones were before, there’s a good chance you now know exactly how important they are in the MCU. Avengers: Infinity War brought all the Infinity Stones together to devastating effect and Avengers 4: Endgame will potentially see the entire movie revolve around the coloured gems in just a few months’ time. Safe to say, it’s probably worth taking a crash course in Thanos’ favourite playthings sooner rather than later. You’ll find everything you need to know about the Infinity Stone in the MCU below, from not only how Thanos got his hands on the Power Stone, Mind Stone, Time Stone, Reality Stone, Soul Stone, and Space Stone, but also the origins of the Infinity Stones as a whole. After all, there’s a reason why the Mad Titan decided to take on Earth’s Mightiest Heroes – and it isn’t because the Infinity Stones look nice on his gauntlet. We’ll even run through what each Infinity Stone does separately because, snap aside, they’re very powerful in their own right. Here it is: Everything you need to know about the Infinity Stones, from their comic book backstory, to the chronological MCU beginnings, right through to the current, very important, Infinity Stones locations. Oh, and we’ll also cover how they ended up wiping out half of the universe and why they’re definitely not done yet. Let’s make it snappy, shall we? Space Stone: There’s a reason why the Red Skull wanted to get his red mitts on the blue cube (known as the Tesseract) that contains the Space Stone in Captain America: The First Avenger. It houses unlimited renewable energy. Bad news for oil companies, good news for evil, purple space-tyrants. Mind Stone: The yellow Mind Stone has taken on a few different forms in the MCU, most notably Loki’s sceptre in The Avengers, and then as part of Vision himself in Avengers: Age of Ultron. First used as a brainwashing tool by Loki, Baron Strucker then exploited it for a series of experiments to create superhumans by unlocking their minds to hidden abilities. Quicksilver and Scarlet Witch gained their powers from these tests, and Vision eventually came into being as a result of the Mind Stone, with Iron Man’s JARVIS operating system becoming fused into a synthetic body originally crafted for Ultron. Reality Stone: The ruby-red Reality Stone is a bit harder to describe, with its powers affecting humans by essentially rotting them away. If the Reality Stone latches on to a powerful enough host, it can increase the host’s strength (as it did with Thor: The Dark World baddie Malekith) and can help convert matter into dark matter. In Infinity War, Thanos manages to use it to manipulate matter itself, turning Star-Lord's blaster into a bubble gun. Power Stone: The Power Stone has to be kept in an special container because, guess what, it’s really powerful. It carries enough power to wipe out a planet and, in Guardians of the Galaxy, the purple stone increased Ronan the Accuser’s strength and durability tenfold. Time Stone: The Time Stone, once held in the green-tinged necklace known as the Eye of Agamotto in Doctor Strange, can manipulate time to the user’s will. Fast, slow, rewind, you name it, the Time Stone can do it. Handy for when you’re late for work, then. Soul Stone: We’ll have to look to the Marvel comics for help here because the Soul Stone hasn’t been fully revealed in the MCU yet, despite it finally appearing in Infinity War. The Soul Stone is definitely orange, as shown by the hue when Thanos and young Gamora meet after the snap. As for its power? The Soul Stone could prove to be the most powerful Infinity Stone of them all. Its powers in the comics range from reviving the dead to stealing super powers. So, basically, they're immensely powerful when separated and, together... well. You saw what happened. Half the universe got wiped out. In the first Thor movie, Odin calls them “an ancient force of infinite destruction,” so yeah… they’re not playthings. In fact, they’re so powerful that Thanos created the Infinity Gauntlet just to hold them all. 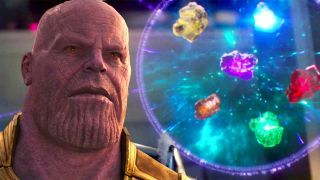 Most Stones are stored in containers and are, wisely, kept away from each other, but Thanos has a few tricks up his sleeve (or should that be gauntlet?). Where did the Infinity Stones come from? This is where things get a bit weird, so bear with me. The Infinity Stones have a bit of a convoluted origin, both in the comics and the MCU. The comics’ origins see the Infinity Stones introduced as Soul Gems before Thanos labels them ‘Infinity Gems’, which has stuck ever since. The Gems are also literally a being – one of the oldest in the universe – who committed suicide because he was so lonely and then split into six powerful fragments. See? Told you it was weird. As for the MCU, the story goes (explained in full in an exposition-heavy scene in Guardians of the Galaxy) that six entities existed before the universe even came into being (try getting your head around that one) and, after The Big Bang, the entities transformed into the six Infinity Stones, one for every fundamental aspect of the universe. Okay, slightly less weird, but still fantastically silly. When did the Infinity Stones first appear? The Stones/Gems/big shiny things that make everything go bye bye were first introduced in 1972’s Marvel Premiere, but really brought into the comic mainstream in 1990/91’s The Infinity Gauntlet. Thanos brought the Infinity Stones together in his Infinity Gauntlet. Long story short, he ruled the universe, killed off half of its inhabitants, and (nearly 30-year-old spoilers here) eventually ended up at the mercy of every superhero, supervillain, and cosmic entity. Space Stone: The Space Stone was the very first Infinity Stone to make an appearance in the MCU, via a quick glimpse of the blue cube in Thor’s post-credits scene, before becoming a major plot point (and part of Red Skull’s schemes) in Captain America: The First Avenger. It ended up at the bottom of the ocean after Cap crashed into the ice and saved the day, but was retrieved by Howard Stark (that's Iron Man's Dad) while he was looking for Cap. Mind Stone: Found inside Loki’s Chitauri sceptre, this yellow stone has gone on quite a journey, but its first appearance was in 2012’s The Avengers. You may remember it from the time it made Hawkeye turn all blue-eyed and evil. That was the first time we saw an Infinity Stone in action, and it certainly made quite an impact. Reality Stone: This one isn’t as obvious as the others, but the red-tinted Aether from Thor: The Dark World is the Reality Stone. Dark elf Malekith gets his hands on it for his own nefarious ends before being defeated and spoiler: it’s all-kinds of powerful. Just ask Thor and half of London. Power Stone: Best known for fuelling a Guardians one-man dance-off, the Power Stone was eventually embedded in Ronan the Accuser’s weapon, but its first appearance was technically at the beginning of the movie when Star-Lord nabbed it (and its container) in the daring smash-and-grab opening. Time Stone: One of the coolest Infinity Stones to arrive in the MCU was via Doctor Strange. At this point, it may as well have had ‘IMPORTANT PLOT POINT’ etched on it, as Wong revealed to Doctor Strange that the time-manipulating Eye of Agamotto found in the Kamar-Taj library, in fact, holds an Infinity Stone. By this point, Strange had already figured out its power and used it to create an infinite (heh) time loop to trap cosmic villain Dormammu in an endless hell until he relented. Soul Stone: It was the subject of much debate before Infinity War, but the Soul Stone's location was finally revealed to be on the planet of Vormir, being guarded by the Red Skull of all people. Thanos eventually had to sacrifice his own daughter, Gamora, to get his hands on it. The short answer? After the events of Avengers: Infinity War, the Infinity Stones are with Thanos and, yes, while that’s true, half the fun is in the journey. In the latest MCU movie, Thanos’s attempt to collect all six Infinity Stones took up most of the movie. It shows what a big deal they are, but, as some were taken off-camera or in abstract ways, you might need a little refresher on how it all went down. Space Stone: Thanos takes this bad boy after Loki effectively hands it to him on the ship full of Asgard survivors following the events of Thor: Ragnarok. So often shown as being part of the Tesseract, the Space Stone remained in that cube until the Mad Titan plucks it from its container and adds it to the Gauntlet at beginning of Infinity War. Loki wasn’t going to let such power slip from his grasp, though, and attempted to betray Thanos. It did not go well. Mind Stone: Much of Infinity War’s final act revolves around Vision’s role as part-Avenger, part-Infinity Stone vessel. The Mind Stone embedded in his head makes him Thanos Target #1, after all. A decision is tearfully reached by Scarlet Witch to kill her beau, Vision, and destroy the Mind Stone completely. Thanos wasn’t having any of that and uses the Time Stone (which he already has at this point) to reverse time and plucks it from Vision’s head, killing him for a second time. Reality Stone: Midway through Infinity War the Guardians reach the conclusion that Thanos is heading to Knowhere to take the Reality Stone from the Collector. They were right. A devastated set of gubbins and artefacts are all that’s left from the Collector’s museum as Thanos begins to toy with the Guardians, showcasing the Reality Stone’s power by turning Star-Lord’s bullets into bubbles. Power Stone: This is an interesting one, as it’s the only Infinity Stone we don’t see taken by Thanos during the course of the movie. We find out second-hand from Thor that, before the events of the movie, Thanos takes it upon himself to travel to Xandar (where the Guardians left the Power Stone in the safe hands of the Nova Corps at the end of Guardians of the Galaxy) and takes the Power Stone by force. An earlier draft was going to include how this happened, but directors, the Russos, reveal to ComicBook.com, that “it was easier to deal with it off-screen”. Time Stone: Amazingly, Doctor Strange - who is sworn to protect the Time Stone - hands it over to Thanos during the final battle on Titan. Before that happens, he uses it to see the future (14,000,605 times to be exact) and there’s only one series of events where the Avengers triumph over Thanos. That makes his reasoning to hand over the Time Stone slightly less puzzling, but he does it all the same. Soul Stone: Thanos sacrifices Gamora (the thing he loves) on the planet of Vormir so he can claim the Soul Stone. The location of the Soul Stone has been a mystery for some time, but we learn that Gamora discovered its location some time ago and has been hiding it from Thanos. After Thanos tortures her sister Nebula, Gamora agrees to show him where it is and we find out that the Red Skull - who seemingly died in Captain America: The First Avenger - is its keeper. What do the Infinity Stones have to do with Avengers: Endgame? The Infinity Stones were such a big part of Thanos’s (successful) plan in Infinity War, you’d be forgiven for thinking they won’t play a big role in Avengers: Endgame, but that’s not the case for various reasons. The only chance to stop Thanos/reverse his plan in Endgame probably lies with the Infinity Stones. Whether it’s by using them to time travel to reverse the Snappening, or simply destroying them entirely, it’s clear that – after all this build up – the Infinity Stones will be the key to whatever plan Cap and co have to save everyone. We’ve already seen what they can do, and so has every one of Earth’s remaining heroes. The recent Endgame trailer shows the consequences of using the Infinity Stones: empty cities, heroes coping with loss, and a tiny fragment of optimism. Endgame is going to deal with the Infinity Stones’ effects, sure, but it’s also going to provide the fuel for Cap and the gang to strike back after seeing what the snap did to their friends. To put it simply: we haven’t seen the last of the Infinity Stones. Whether it’s in the past, present, or future, they’re going to be crucial to either settling the beef with Thanos in Endgame or rewinding everything so this whole sorry mess never happened. Mad about Marvel? Watch the video below to see the MCU without special effects - it's weird!